WARNING: This post is a bunch of nostalgia. Feel free to follow along if you recall the DOS days of the early-mid 1990s. Also, if you’re interested in the Gravis Ultrasound Experience CD-ROM, you can download the compressed ISO image here (137 megabytes). This only contains the data track as a .ISO file. However, the Internet Archive hosts the disc in CUE/BIN format which includes all the data tracks. I finally let go of my Gravis Ultrasound MAX sound card a little while ago. It felt like the end of an era for me, even though I had scarcely used the card in recent memory. What is the Gravis Ultrasound? Only the finest PC sound card from the classic DOS days. Back in the day (very early 1990s), most consumer PC sound cards were Yamaha OPL FM synthesizers paired with a basic digital to analog converter (DAC). Gravis, a company known for game controllers, dared to break with the dominant paradigm of Sound Blaster clones and create a sound card that had 32 digital channels. New haul of games, new (old) multimedia formats. 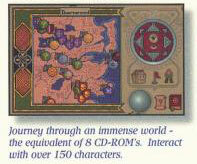 Ahem, “Journey through an immense world — the equivalent of 8 CD-ROMs.” Yet, when I procured the game, it only came on a single CD-ROM. It’s definitely a CD-ROM (says so on the disc) and, coming from 1995, certainly predates the earliest DVD-ROMs (which can easily store 8 CD-ROMs on a disc). Thus, I wanted to jump in a see if they were using some phenomenal compression in order to squeeze so much info into 600 or so megabytes. I was surprised to see the contents of the disc clocking in at just under 40 megabytes. An intro movie and an outro movie account for 75% of that. Format? None other than that curious ASCII anomaly, ARMovie/RPL with Escape 122 codec data. 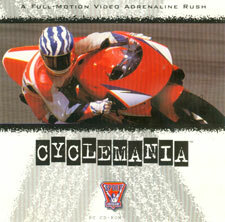 Cyclemania is one of those FMV backdrop action games, but with a motorcycle theme. I had a good feeling I would find some odd multimedia artifacts here and the game didn’t disappoint. The videos are apparently handled using 3-4 discrete files per animation. I’ve documented my cursory guesses and linked some samples at the new MultimediaWiki page. This is unrelated to this particular acquistion, but I was contacted today about audio files harvested from the 1993 DOS game Star Trek: Judgment Rites. The files begin with the ASCII signature “Interplay ACMP Data”. This reminds me of Interplay MVE files which begin with the similar string “Interplay MVE File”. My theory is that these files use the ACOMP compression format, though I’m still trying to make it fit. Wiki and samples are available as usual if you’d like to add your own research.